So just how do you get your hands on the hottest tickets in town without falling foul of the touts? Gigantic is here to help! In the wake of the industry’s concerted efforts to take on the touts, we wanted to give you an insider’s guide for getting hold of tickets from your favourite music, theatre and festival event. The best way to know; what’s going on sale and when, is to sign up to our mailing list. You’ll receive regular updates of what is going on sale in advance; can set reminders and have the best chance of getting tickets the moment they go on sale. Plus, if you’re signed up to receive emails from us, we’ll always email you about an artist or event you’ve previously booked for. Do you have a coffee in your hand? Staying calm might sound easier than it actually is, but try and relax, you got this. Right, so you’ve got the tickets in your basket, you can smell the mosh-pit already, all you have to do is pay. So, don’t make a schoolboy and leave your debit card in your other jeans. Have it ready as tickets are only help for a limited time. 5 Miss out? Don’t fret! If tickets sell out then don’t fret. Quite often extra tickets are added for shows at a later date. By signing up to our event/artist waiting lists, these additional tickets will become available and you’ll be notified. Consider your options. Is the artist you want to see performing elsewhere? How about a UK city break to see your favourite band? Or are they playing any festivals this year? If you’re able to be flexible and the budget allows it then tickets might still be available in other locations. 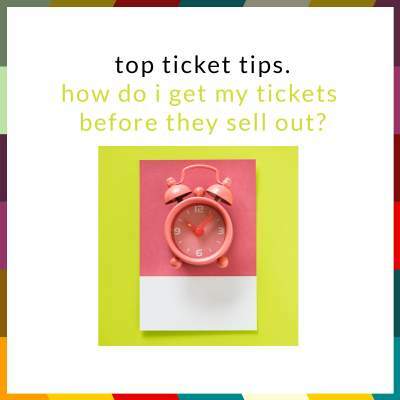 That’s our top tips for purchasing tickets.